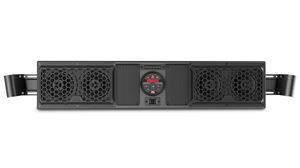 The MTX MUD6SP is an outdoor, weather-resistant, and super-rugged universal sound bar solution that is designed to deliver exceptional audio quality to any motor sports vehicle. This all-in-one unit includes six total speakers delivering all of the power you need to hear your music while you are speeding over land or water. The unit size is 21-3/8" long, universal mounting clamps fit 1.75" and 2.00" bars. Built for your wildest rides. Wash down afterwards. The MTX MUD6SP is a universal sound bar solution that is designed to deliver exceptional audio quality to any vehicle. This all-in-one unit includes six total speakers, four 3" full range drivers and two 1" high frequency tweeters. All speakers are connected to an internal power amplifier that delivers all of the power you need to hear your music whether you are on land or water. Play music directly from your smartphone or tablet via an external 3.5mm input. Additionally, the unit includes a 3.5mm auxiliary output allowing you to integrate an external amplifier and subwoofer if desired for even greater sound coverage. The unit features an all-weather design so you can rest assured that wherever you take it, your music can come with you. The universal mounting clamps can be used on the top, bottom, or back giving you multiple options for installation. The MTX MUD6SP is compact enough to fit on any vehicle but powerful enough to ensure you are heard wherever you go.